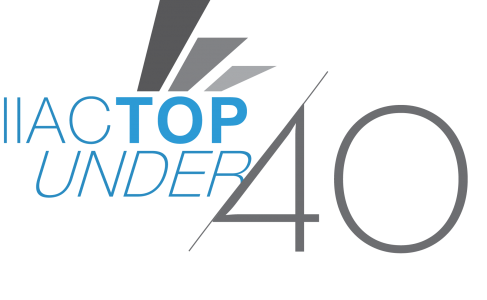 The IIAC Top Under 40 Award recognizes and celebrates the new generation of highly motivated and talented young professionals whose drive, dedication, personal and professional qualities and accomplishments have brought distinction to the investment/financial industry. This year’s recipient will be announced and celebrated at the Investment Industry Hall of Fame Gala Dinner and Induction Ceremony to be held on October 24, 2019. • Involvement in one’s company events, workshops, etc. • Promotion of the profession through communications (speaking, writing, media), recruiting students, etc. • Excellence in any career position, other professional or academic achievements, etc. • Teaching, mentoring, coaching, etc. • Charitable community work, service to the profession, and dedication to public service. The Nominee must be a full-time employee of an IIAC Member firm who was under the age of 40 as of December 31, 2018 and who has not previously been a recipient of the Award. For a list of IIAC Member Firms, please click here. An independent committee will approve and adjudicate nominations for the IIAC Top Under 40 Award. Members of the Committee are not eligible to be nominated or submit nominations. Any member of the public may nominate an employee of an IIAC Member firm, or one of its divisions or subsidiaries within the financial services industry by completing an online nomination form, or by email to topunder40award@iiac.ca. The Award is presented to an individual, rather than to pairs or teams. Please ensure your submission is for an individual. Call for 2019 nominations closes on Friday, June 14, 2019. The 2018 IIAC Top Under 40 Award nominees were featured in the September 2018 edition of Investment Executive. To see the full-page advertisement, click here. The 2017 IIAC Top Under 40 Award nominees were featured in the September 2017 edition of Investment Executive. To see the full-page advertisement, click here. The 2016 IIAC Top Under 40 Award nominees were featured in the September 2016 issue of Investment Executive. To see the full-page advertisement, click here. The 2015 IIAC Top Under 40 Award nominees were featured in the September 2015 issue of Investment Executive. To see the full-page advertisement, click here. 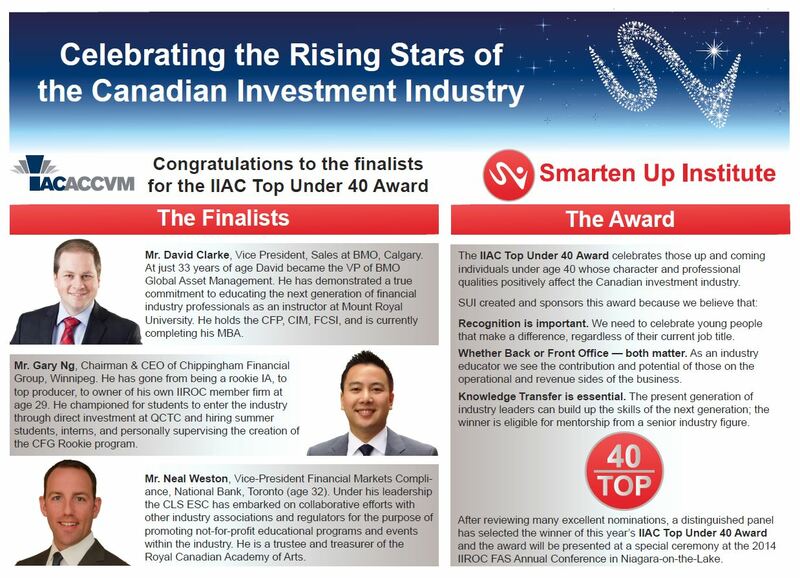 The 2014 IIAC Top Under 40 Award finalists were featured in the September 2014 issue of Investment Executive. To see the advertisement, click here.